I was sitting here this morning, trying to think of a photo that would be good to post on the first day of the year ... and this is the one that came to mind. 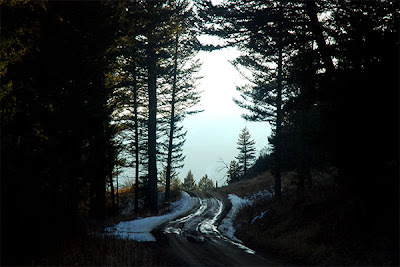 I took it back in 2007, on an old dirt road that headed down from the Bangtails into Bridger Canyon. That is such a hopeful photo! Especially the tiny patch of light, glowing gold. "Love and joy come to you, and to your wassail too; and God bring you a happy new year...."
(Be very glad I'm typing it to you, and not singing it in person....) I'm not sure how love and joy would come to your wassail; one would think that would be the by-product, but the wishes are sincere. I'm very glad you like that shot ... it's one that I like, too, and I sensed the same message in it. And from my perspective, at least, 2009 was a year that could definitely be improved upon -- so let's hope that it happens! And a very sincere thanks for the good wishes ... I hope there's a wonderful 2010 in store for you and your family.